Oz Lotteries is Australia’s premier hub for playing the lotto online. It offers all the most popular games within Australia and is free to join. So whether you fancy your lucky numbers for the jackpot, or want to share a syndicate ticket with your friends, OzLotteries.com is your one-stop site to make it all happen. How many times have you heard about someone having the winning lotto numbers, only to lose their golden ticket? There is no chance of such misfortune befalling you when you play with Oz Lotteries. Your ticket is emailed to you as soon as you purchase it, meaning it is safe from sudden up-drafts and the ravages of the washing machine. Besides the assurance that your magic numbers won’t fall down the back of the couch, or find their way into the rubbish bin, buying your ticket online at OzLotteries.com is the absolute height of convenience. No need to leave the house and waste valuable time in line at the newsagency – a few clicks here, a couple of keystrokes there, and you’ve got yourself a shot at the jackpot. 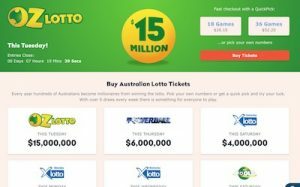 Before you can take advantage of the best selection of lotto games Australia has to offer, you’ll need to open an Oz Lotteries account. This is simple, safe and completely free, and will only take a minute – if that. To get started, click where it says ‘Join Now’ on the OzLotteries.com homepage. You can also click ‘My Account’ in the navigation bar and take it from there. Then just fill in your details, have a look at the terms and conditions, and click ‘Register’. Oz Lotteries features all the major Australian lotto games. Powerball, Oz Lotto, Tattslotto, Super 66, The Pools – you name it, Oz Lotteries has it. Buying a ticket for draws such as the Monday & Wednesday Lotto and the Tattslotto (Saturday Lotto) has never been so simple. If you have access to the internet, you’re already halfway there. Make sure you are signed in to your Oz Lotteries account (if you’re not, then click ‘Log In’ and enter your username and password). On the Oz Lotteries homepage, you will see a list of different lotto competitions – click the ‘Play Now’ button next to the game you wish to play. This step is fun. Select the type of ticket you want (ample available, as listed below), pick your numbers and then click ‘Add to Basket’. Check the details of your order, then click ‘Proceed to Checkout’. If you haven’t already added funds to your Oz Lotteries account, you can do so now via credit card or PayPal. All banking details are securely processed and your personal information is kept secret. Once you confirm payment, you should receive an email with all the details of your order – and presto, you’ve got yourself a ticket! If you have any unanswered questions or general enquiries, customer support is available via email and phone (1300 188 911), or you can check the FAQ section. Oz Lotteries does everything in their power to make life easy for us. After you’ve clicked on the lottery you wish to play, you’ll be given a brief description of the game and several options of what type of entry you wish to purchase. There are a number of different ways you can play and Oz Lotteries makes it easier than ever for us to get the most out of our lotto experience. Once you click on the type of entry you want, full details of when the next draw is, the time, and the price of each game, is available. Oz Lotteries’ thoroughly detailed step-by-step guide of what draw you want to play, the number of games desired, and how to choose your numbers, makes purchasing a breeze. You can even play a game to make choosing numbers fun! You also have the option to automatically buy tickets when a lottery jackpot hits a certain amount. Tickets sell for as little as $0.70. The original and most basic of entries available to us: a standard game entry refers to every standard line of numbers you select for a particular game. You get one chance of winning for each standard game you play. In a System, you can pick up to 20 numbers, depending on the specific lottery draw you go for, and all possible combinations of your chosen numbers are in play. For example: if you pick nine numbers to make a System 9, you have 84 possible combinations for a standard six-number game. A Super Combo gives you more options than a standard game, but covers fewer combinations than a System. For example: a Super Combo with 12 numbers might give you 42 six-number games, whereas a System 12 offers some 924 sequences. However, there is a wide variety of Super Combo plans available, many of which can include more than 20 numbers. A syndicate ticket allows a group of people to share both the cost and the potential spoils of entering a lotto draw. Oz Lotteries Syndicates are open to anyone, much like a public league in a fantasy football game. The elves at OzLotteries.com handle the admin and organisation, as well as the equal distribution of any and all prize money – so you don’t have to deal with that one guy who always wants a little more than he’s owed. Oz Lotteries also offers Social Syndicates, where you can run the show yourself and ask whoever you want to join the group. You can send out invitations to friends, family, colleagues – anyone – via email and social media. And don’t worry if you can’t sell every share, because Oz Lotteries will make empty slots open to the public if they are not filled 12 hours before the scheduled time of the draw. Keen to give it a go? Head to OzLotteries.com today and check out the full range of online lottery tickets available to purchase from the comfort and ease of your own home.